Charlie & The Chocolate Factory….A Chocolate Lover’s Tale! Charlie and the Chocolate Factory is a well known book turned movie about a poor young boy named Charlie Bucket. Charlie is the lucky winner of one of the golden tickets that grants access to the eccentric and very exciting Wonka Chocolate Factory, owned and run by Willie Wonka, chocolate extraordinaire! The story is timeless and has been loved since its creation by writer Roald Dahl in 1964. 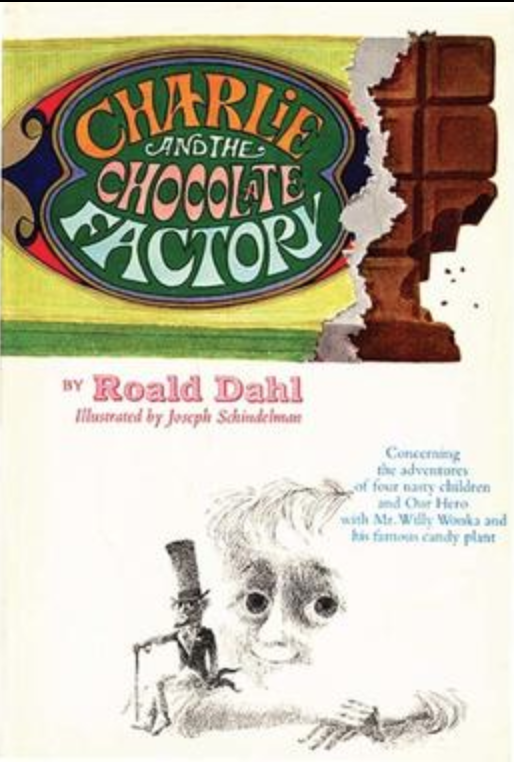 To keep Charlie and the Chocolate factory alive and in the hearts of the children that fell in love with this chocolate tale, Roald Dahl released Charlie and The Glass Elevator in 1971 as a sequel to Charlie & The Chocolate Factory. With a woven tale of the deliciousness of chocolate and the enchanted magic land brought to life by a chocolate lovers imagination most have come to wonder how Roald Dahl created such a masterpiece with chocolate as its focal point! Well, believe it or not it comes on the heels of his own love for chocolate and his experiences as a child! Back in the 1920’s when Roald Dahl was yet to be the famous author he is, and just a young school boy he had a love for chocolate. Growing up in England, home of two of the best & largest chocolate companies, Cadburyand Rowntree, Dahl often had exposure to these companies through school. Determined to be accredited as the best chocolate maker both companies competitively tried to win the love of England’s chocolate lovers starting at a young age. Cadbury chocolate company ( think Cadbury Easter eggs) in an attempt to perfect their chocolate, would send smaples of their products to the schools in return for feedback from the kids on their chocolate and new products offered. The school kids, such as Roald Dahl himself, loved the free & delicious chocolate and welcomed the decadent taste testing. However, both chocolate companies would not let the other “one up” them. This in turn fueled the competition between each chocolate company. It in fact ignited such a big competitive flame that both chocolate companies were known to send in spies posing as employees to the others chocolate factory to potentially steal secrets and recipes. Hmmm, sounds like a story most of us have heard! Indeed this is the inspiration to Roald Dahl’s timeless best selling children’s book, Charlie and The Chocolate Factory! A story that we once thought could only be imagined, actually was based on true events!! Needless to say, although the roots of the story of Willie Wonka and his Chocolate Factory are important nothing perhaps is more important than the happiness and wonder that it has brought in the eyes of children. Watching the movie and seeing the creative and elaborate chocolate facility is a dream of many young kids, as well as chocolate lover’s throughout the world. Reading the book an using your own imagination perhaps makes it even more magical. As a blog dedicated to chocolate and the love and deliciousness that it provides to all those throughout the world, we thought it only right to dedicate a post to Roald Dahl, chocolate lover and most possibly one of the greatest children’s writers of all time. If truth be told, I’m sure it is pretty safe to say that even adults love Charlie & The Chocolate Factory in all it’s chocolate splendor. Chocolate. Chocolate has been said to be an aphrodisiac, to produce the same feel good hormones that come from doing things that feel good and we enjoy. It is known to be a stimulant because of the caffeine and sugar content, as well as something the body craves because of the fat content, which the human body stores to create energy. What some of us, including myself, did not necessarily know was that chocolate is also a great tasting quick energy boosting fix for avid hikers. When I say hikers I mean the type of hiking advocates that go on organized expeditions through beautiful canyons and mountain ranges. The kind that spend a few hours just exploring all that nature has to offer. While I myself wouldn’t think chocolate would be a first choice snack for the obvious health conscious, I did see first hand that chocolate is literally enjoyed and eaten by even the healthy exercise enthusiasts of the world. While on a hiking trip with grandstaircasediscoverytours.com, exploring the great Grand Staircase a few fellow hikers in my group pulled out organic chocolate bars as we sat on a grouping of rocks taking a small break from our beautiful hiking tour. I mentioned that I was an avid chocolate lover myself and that all this hiking was sure to award me with a chocolate bar or some delicious dessert when I returned home. One of the hikers by the name of Alex smiled and said that he often brought a chocolate bar with him on long hikes or even trail mix mixed with chocolate pieces. He told me he didn’t scarf the whole chocolate bar at once, or the trail mix for that matter. He said eating a piece here and there gave him a quick energy boost and the added fat helped to keep his momentum sustainable. Laughing he said “eating chocolate puts me in a better mood”! I told him I never thought about it that way but that actually sounded like a very good idea to me. He then leaned over and offered me a piece of his organic sea salt and chocolate bar. Winking he said the salt helps replenish all that I have lost through sweating. Laughing I thanked him and ate my chocolate. Then, then something amazing happened. We started on our trek through this naturistic wonder of beauty, and I felt more energized, definitely in a better mood, and just an all over feeling of contentment. The hike we took was breathtakingly beautiful, the group of friends I was with and I had an incredible day. So although many look at chocolate as a sinful delight, something that you feel like you need to get a good workout in to enjoy, really is meant to be enjoyed at any given time. Perhaps it goes hand in hand with the old saying “Everything in moderation”. Moderately eating chocolate on a day to day basis sounds just fine to me!! Do you want to know which chocolate bar to choose when you are at your local grocery store? The isles are littered with chocolate bars, and it’s impossible to know which ones are good and which ones are bad. They are all masked with fancy packaging and marketing strategies, and often you are choosing between which labeling you prefer, because there is now way to discern which chocolate has the superior taste, texture, or flavor profile. That’s why we are here, to help you weed through the noise and find the best chocolate on the market.